The more Jordan Clarkson can get his teammates involved in the offense the more dangerous the Tigers will be. ST. LOUIS — A team can’t qualify for the NCAA Tournament in December but a loss or two during this time of year certainly can make gaining entrance into the dance more difficult. Ask the 25th-ranked Missouri Tigers. They lost a chance to add to their postseason resume with a one-point setback to Illinois last Saturday. Now they face another challenge that, because of last week’s loss, could prove even more telling to their eventual tournament chances. Win at North Carolina State (9-2) Saturday night and the Illinois loss becomes a mere blemish on Missouri’s early season. But lose a second straight game and the Tigers (10-1) will be looking at a nasty stain on their non-conference schedule. The Wolfpack offer a far tougher test than Illinois, too. They’re bigger, deeper and are improving. Plus, this will be Missouri’s first real road game of the season, though it has played four games on neutral floors. PNC Arena might not provide N.C. State with the home-court advantage of a Cameron Indoor Stadium, but the Tigers can expect thereabouts of 15,000 rooting against them at the 8 p.m. tipoff (ESPN2). N.C. State features more of an inside threat than any team the Tigers have faced. The Wolfpack have won seven straight since 7-1 senior Jordan Vandenberg returned from an ankle injury. The team’s best player is 6-8 sophomore forward T.J. Warren, who is averaging 23.9 points and coming off a career-best 32-point effort against East Carolina. Unlike most teams the Tigers have faced that go with three guards in the starting lineup, N.C. State opts for a third big in 6-8, 245-pound freshman Lennard Freeman. While the Wolfpack are strong on the inside, inexperience in the backcourt should play to Missouri’s strength, its three-guard attack of Jordan Clarkson, Jabari Brown and Earnest Ross. N.C. State starts 6-2 freshman Anthony Barber at point guard and junior-college transfer Desmond Lee at the other guard. N.C. State has come a long way since losing at home to North Carolina Central five weeks ago. Two games ago, the Wolfpack went to Tennessee, a team picked to finish ahead of Missouri in the SEC, and stormed to a 37-20 halftime lead on the way to an impressive victory. "You see them getting better because they’ve got all these parts that are new and different," Tigers coach Frank Haith told the Columbia Daily Tribune earlier this week. "I’m not as worried looking at the North Carolina Central game as looking at what they’ve done the last couple games and how they’ve played." As for his team, Haith seems to have softened his stance from the aftermath of the Illini game when he said the Tigers had been out-toughed. After watching the game on video, he said he was "really encouraged by how our guys competed." The Wolfpack’s best player is 6-8 sophomore forward T.J. Warren, who is averaging 23.9 points per contest. "We very easily could have won that game and I thought there were a lot of good things we pulled out of that game that were positives in terms of how we played as well as some things we’ve got to get better at," he told the Daily Tribune. Clarkson’s play led the positives. The junior transfer played his best game against Illinois, finishing with 25 points, eight assists and six rebounds. After a first half during which Haith thought Clarkson held onto the ball too much, he seemed to be a more willing passer after the intermission. But, as it is whenever your best scorer is also your point guard, finding the right balance of shooting and passing figures to be a season-long challenge. As Haith pointed out, "There’s no question we’re going to be better the more he gets guys involved." 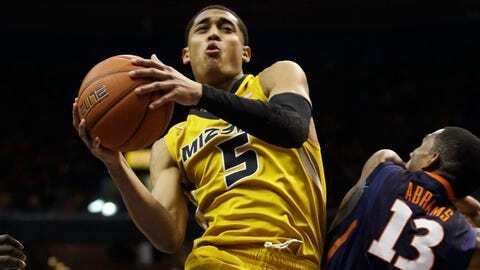 Missouri’s other areas of concern, frontcourt play and length of the bench, also were on display against Illinois. Freshman Johnathan Williams III and sophomore Ryan Rosburg combined for eight points and eight rebounds, just four on the defensive end. The Tigers played only seven players, and neither of the backups, point guard West Clark and forward Tony Criswell, contributed much besides a combined six turnovers. The Tigers need more than increased production from those two. They need another player or two to become a fixture in the rotation. Keanau Post, a 6-8 junior college transfer, and a pair of freshman, point guard Shane Rector and 6-8 Torren Jones, are the leading candidates to see more minutes. Haith, however, said he didn’t use them against Illinois because "I just didn’t know if some guys were ready to take that on." He added, "I would love to get to nine, but obviously, eight is the number, if we could get to eight and work through that." Trying to build up the bench is difficult enough. The challenge becomes even tougher when you’re also trying to build up the postseason resume. You can follow Stan McNeal on Twitter at @stanmcneal or email him at stanmcneal@gmail.com.